In recent decades, marshes naturally dominated bySpartina spp. have been replaced byPhragmites australis throughout the northeastern United States. We suggest that early in this invasion there was little effect on the fish fauna. As the invasion proceeds, the marsh surface habitat became more altered (i.e., elevated, flattened, reduced water-filled depressions, and reduced standing water), which resulted in a reduction of feeding, reproduction, and nursery function for fishes, especiallyFundulus spp. These potential changes in marsh habitat and function have resulted in numerous attempts to removePhragmites and restoreSpartina spp. 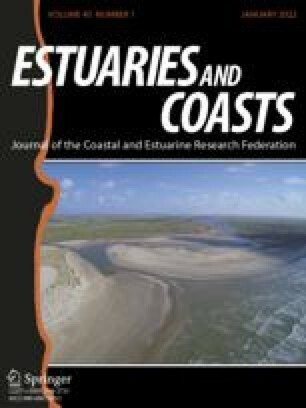 To evaluate the response of marsh surface fishes toPhragmites treatment, we examined fish use in the brackish water reaches of Alloway Creek in the Delaware Bay estuary. ReferencePhragmites habitats were compared with referenceSpartina alterniflora-dominated habitats and sites treated (1996–1998) to removePhragmites to restore former vegetation (i.e., restored, now comprised of 100%Spartina). Fish were sampled with an array (n=9 at each site) of shallow pit traps (rectangular glass dishes, 27.5×17.5×3.7 cm). Small individuals (mean=17.5, 5–45 mm TL) dominated all pit trap collections. Fish abundance was highest at the restored (catch per unit effort [CPUE]=2.16) andSpartina (CPUE=0.81) sites with significantly lower values atPhragmites (CPUE=0.05) habitats. Samples were dominated by young-of-the-year mummichog,Fundulus heteroclitus (98% of total fish, n=631). The only other fish species collected was spotfin killifish,Fundulus luciae (2% of total catch, n=14), which was only present in restored andSpartina habitats. These observations suggest that the restored marsh is providing habitat (water-filled depressions on the marsh surface) for young-of-the-yearFundulus spp. These marshes are responding favorably to the restoration based on the much greater abundance of fish in restored versusPhragmites habitats and the overall similarity between restored andSpartina habitats.